for specific actual periods of concern up to and including full 23 year data 1990 - 2012 inclusive. Exemplary Energy has developed an approach whereby representative data may be selected for a targeted purpose and applied to the respective simulation models. The data can be provided in any format. To view the 100 sites list and price please click here. For more information about this approach please refer to the IBPSA paper: Lee - paper (PDF - 228k). To download a sample RMY (Reference Meteorological Year) file of Borroloola, NT in ACDB format please click here. The 4th Edition of the Australian Solar Radiation Data Handbook (ASRDH) and the corresponding software AUSOLRAD are available. ASRDH provides suitable solar data for teachers, researchers, users and designers of various types of solar systems for many locations around Australia. Preview of ASRDH please click here. Australian Solar Radiation Software (AUSOLRAD) is able to create tables for a location at any oriention (including sun-tracking), any tilt (including facing down), any overhang, any ground albedo (reflectance). An overview of AUSOLRAD please click here. The book and software can be purchased by contacting us. BOM periodically releases satellite estimated data of gridded global horizontal irradiance (GHI) and direct normal irradiance (DNI) data, in watts per square metre. This hourly data accounts for virtually the whole of Australia, and is derived from satellite imagery processed by the BOM at the time of the satellite scan. We have developed the Exemplary Australian Solar Energy Atlas (EASEA) software to visualise the GHI and DNI on a computer screen. Further, the extraction of time series for individual locations was perfected so as to allow the extraction of hourly data, with the data interpolated minute-by-minute to values at exactly on-the-hour local standard time. The map shows GHI February monthly average, please contact us for maps of seasonal and monthly averages for both GHI and DNI. Please contact us for the latest solar radiation data resources of any locations in Australia. The quality assured 23 years of hourly climate data include Temperature, Moisture, Atmospheric Pressure, Wind Speed, Wind Direction, Cloud Cover, Solar Irradiance (GHI, DNI and DIF), Solar Altitude and Solar Azimuth. Other weather elements can be provided upon request. Data for 100 locations around Australia is available. Data is normally delivered in ACDB, TMY2 and EPW format, customized format can also be provided. Quality assured Real Time Years (RTYs) of hourly data up to literally yesterday can be provided. This service is routinely provided on the first working day of the month for weather experienced and measured to midnight on the last day of the preceding month. Data sets for Sydney and Canberra are available and the team at Exemplary Energy in Canberra is working on expanding this service to other centres in the near future. Samples of RTY data (Jun2012 - July2013 in ACDB format, other formats upon request) for Canberra and Sydney are downloadable from here. For a brochure click here. Please contact us for the latest update. Click here to view the PV system energy yields with the latest RTY data. Large-scale systems typically operate for a life cycle of 20 years or more. Any renewable energy system or building is likely to experience a change of climate over its effective functional lifetime. Exemplary Energy has developed advanced techniques to create Ersatz Future Meteorological Year files (EFMY) to ensure that plant systems are designed and financed with due consideration of a changing climate, by predicting the range of likely and foreseeable future system responses producing RMY data sets for future climate scenarios by combining CSIRO climate projections with baseline data representative of "current" climate. 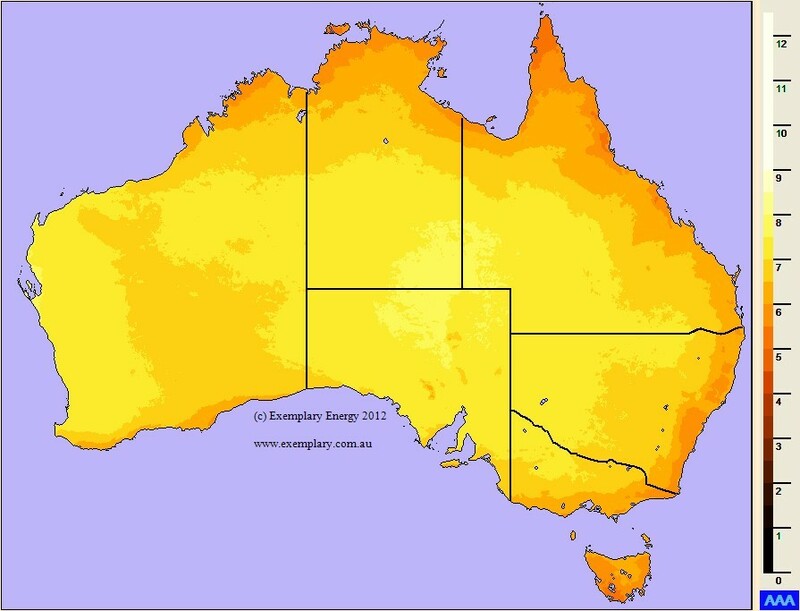 The Exemplary ASEA (Australian Solar Energy Atlas) is a software package that will incorporate the BOM satellite data as well as many features of its predecessor, the ASRDH and AUSOLRAD. The database for the program is the hourly data derived from images scanned now by the BOM's GOES-9 and previously by the GMS-5 satellite. The Exemplary ASEA will allow the user to select a time zone, time and date over more than a decade and display a range of colour bands representative of an approximate irradiance interval. An intuitive colour scheme is used to differentiate between particular ranges. Each of the estimated 278,000 pixel locations displays an irradiance value in a map of daytime Australia, represented as a 5km x 5km square grid. Short time-lapse ��movies�� will also be possible. The data can be integrated over time to represent annual, seasonal and monthly means to visualize the national climate, a locale or to home in on the climate of a particular site.